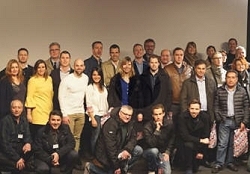 ENEX co-ordinators gather in Brussels to discuss TV newsgathering. Brussels, March 2017: More than 60 delegates from the ENEX partner base recently gathered for the annual Coordinators Meeting in Brussels. They were granted a glimpse into the future as partners and invited speakers took part in sessions that examined how journalism, new technology and government intervention might shape how we all work in the coming months and years. Mobile journalism came under the spotlight as colleagues from BFM talked about how their new Paris-based news channel uses only iPhones for all their picture gathering and reporter lives and an app demonstration looked at how those pictures can be edited on the move. Investigative journalist Khadija Ismayilova, who was interviewed live into the meeting via Skype, shared her powerful story of blackmail and imprisonment by the Azerbaijaini government as they seek to clamp down on freedom of the press. Editorial figures from the ENEX partner group joined in with their first-hand experiences of governments placing restrictions on the media. The conference was generously hosted in Belgium by RTL TVI at their offices and the traditional Coordinators’ Dinner was at Leon’s, one of Brussels’ most famous brasseries.